When it comes to cooking, it's safe to say that Gordon Ramsay has mastered it. While the celebrity chef needs no introduction, he's most recognized as the cutthroat judge on popular television series, MasterChef. On the back of that success, he launched his own hit shows, including Ramsay's Kitchen Nightmares and Hell's Kitchen. His self-titled Michelin-starred restaurants are lauded globally, and he has published over a dozen best-selling cookbooks. In his most recent, , he offers simple globally inspired recipes for both the experienced and the novice chef. 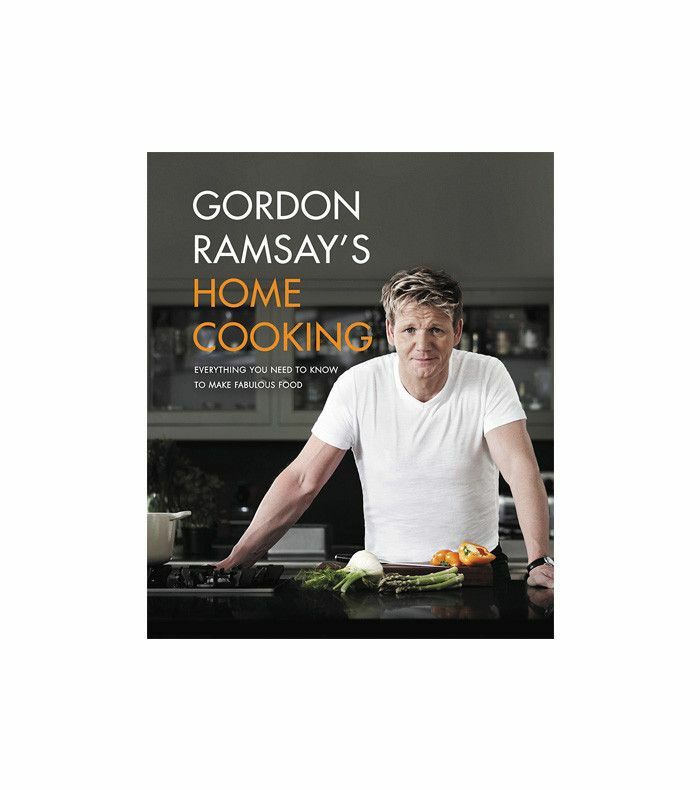 In this exclusive excerpt, Ramsay shares his secret to cooking for one (or two) along with three recipes you can make for yourself (and one other) at home. Much as I love big-occasion cooking—the sociability, the chance to show off a bit—the reality of day-to-day life isn't like that. Much more often it's about coming back late from work and needing to get dinner on the table quickly, and that calls for a whole different set of skills. It's easy to be motivated when you've got the promise of an appreciative audience who will make all the right noises, but when you are cooking just for yourself or perhaps a partner, you can quickly lose heart and see the whole process as a chore. That's when the temptation to fall back on takeout is the strongest. Don't be ashamed if that sounds like you—I'll let you in on every chef's dirty little secret. When they get home after evening service, what is the thing they are most likely to whip up before going to bed? A homemade burger? A cheese soufflé? I wish. No. Baked beans on toast—at least here in the U.K. Half of them don't even bother warming them up, they just spoon them out of the can. I know, I know: it's late, they've spent all day in the kitchen, and they just want to collapse into bed. But it does show that it isn't skill or know-how that gets in the way of proper cooking, it's convenience. So the solution to cooking for small numbers is to make it as easy as possible—so simple, in fact, that picking up the phone and waiting for the pizza boy to deliver will seem like too much of a hassle in comparison. That's my aim here. We think of fast food as being what comes in cardboard boxes from takeout shops, but in this chapter (from Gordon Ramsay's Home Cooking), you'll find a bolognese sauce that will be ready before the pasta's even had time to boil, fishcakes you can assemble from a few cans and jars, and a chili hot dog that's in another league from anything you've had before. When everyday food is this fast and tastes this good, it soon becomes a pleasure. If you want cooking to be hassle-free, you've got to start with the basics and make the shopping as uncomplicated as possible. Dishes should focus around two or three key flavors on the plate, maximum, as in Mushroom and Leek Pasta. Any more and you're not only making extra work for yourself, but you'll be confusing your palate. In my years of filming Kitchen Nightmares (in which I go around to restaurants trying to sort out failing businesses), this has been by far the most common mistake. Young chefs, in particular, feel they have to put their all into every plate and tend to overcomplicate their cooking to show what accomplished cooks they are. In fact, the opposite is true. The best cooks know not to hide behind lots of competing flavors and are happy to let their main ingredients shine. Mushroom and leek pasta, for example, should taste of mushrooms and leeks. You might like to add some tarragon, perhaps, which marries the two ingredients together, or some bacon, but there really is no need to start throwing in lots of other strong flavors. It doesn't need them. Respect your main ingredients and they won’t let you down. A happy side effect of this is that the shopping is much easier too—even more so if you keep a well-stocked pantry. Think of this as the springboard for your cooking, so you need only pick up a couple of main ingredients—some sausages, say, or some eggs—to then take your cooking in whichever direction you choose when you get home. You’ll find countless variations of pizza around the world, where a dough base is used as a plate to carry other ingredients. In this version, the saltiness of the feta works beautifully with the sharp sweetness of the pomegranate molasses and the anise crunch of fennel. 1. Drizzle the flatbread with a little olive oil on each side and season with salt and pepper. Heat a frying pan over medium heat and toast the flatbreads individually for 2 minutes on each side until golden and turning crisp. 2. Remove the flatbreads from the pan and keep warm. If necessary, wipe away any remaining oil in the pan, then toast the fennel seeds for about 1 minute until aromatic. Remove and set aside. 3. Shave the fennel bulb into thin slices using a mandoline or vegetable peeler. 4. Sprinkle the shaved fennel over the flatbreads, then scatter with the feta and fennel seeds. Drizzle some pomegranate molasses over each flatbread and serve. Pomegranate juice that has been boiled down to a dark brown, sweetly tart liquid. Essential to much Middle Eastern cooking and available from Persian or Asian grocery shops, or online. There are very few dishes you can’t simplify and strip back to their essence. This is a fast and simple open lasagne that doesn’t need any time in the oven. Put the pot on for the pasta before you’ve even taken your coat off, and you’ll have dinner on the table in 10 minutes. 1. Heat a large frying pan and add a dash of oil. Season the mushrooms with salt and pepper and start to sauté them, adding the garlic after 2 minutes and the leek a minute later. Cook for 6–8 minutes until the leek is soft and the mushrooms are colored on the outside. Taste and adjust the seasoning. 2. Add the stock and boil for 5 minutes until reduced by half. 3. Meanwhile, cook the lasagne sheets in a large saucepan of boiling salted water for 4 minutes or until just al dente. 4. While the lasagne is cooking, add the cream to the frying pan and simmer for 2–3 minutes to reduce a little. 5. When the lasagne sheets are cooked, drain and add to the pan with the sauce, stirring until well coated. Turn off the heat, add the tarragon leaves, and allow to sit while the bread toasts. 6. To prepare the bruschetta, preheat a grill pan or the broiler. Rub the slices of ciabatta with olive oil and the cut side of the garlic clove and toast for 1–2 minutes on each side until golden brown. 7. To serve, spoon the lasagne and mushroom mixture onto serving plates, layering them up attractively. Serve the toasted bruschetta slices on the side. This vegetable stew is such a simple combination of ingredients, but they undergo this amazing transformation during cooking to become more than the sum of their parts. Another dish that just gets better and better the longer you allow the flavors to mingle. 1. Heat a heavy-bottomed casserole dish over high heat. Add a glug of oil and cook the eggplant for 3–4 minutes until colored on all sides. Add the garlic and onion and cook for another 5 minutes until the onion is tender. 3. To serve, slice the bread and toast on each side until golden. Stir the mint through the eggplant, spoon onto the slices of toast, and scatter over the crumbled feta. Serve warm. "Although it’s not essential to salt eggplant before you cook it, doing so draws out the moisture and makes it absorb less oil. Simply chop or dice the eggplant as instructed, place in a colander, and sprinkle with about 1 teaspoon of sea salt. Leave for 30 minutes, then rinse well, pat dry on paper towels, and cook as you like." What are your favorite meals when cooking for one? Excerpted from the book GORDON RAMSAY'S HOME COOKING by Gordon Ramsay. Text copyright © 2012 by Gordon Ramsay. Reprinted with permission of Grand Central Life & Style. All rights reserved.